The Red Room. The victor of this round will voyage to Calgary, to duke it out for the Western Canadian tile. If our local powerhouse claims the Western title, they will move on to Toronto for the final Canadian Battle! Who will reign supreme in Vancouver? This year's contestants and more details TBA very soon! Often under-estimated, but always a force to be reckoned with. Canada has forged such heavyweights as Exciter, Annihilator, Skull Fist, Devin Townsend, Voivod, Anvil, Razor, Into Eternity and more. 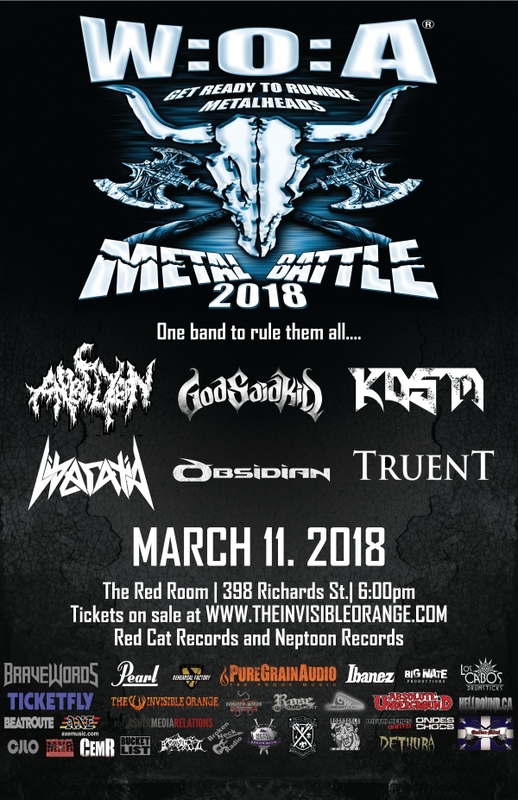 The Quebec region, re-known for their love of extreme metal, has spawned the likes of Kataklysm, Cryptopsy, Martyr, Gorguts and Quo Vadis. Not to mention an impressive new wave of modern metal including Alexisonfire, 3 Inches of Blood, Protest The Hero, Cancer Bats, Baptized In Blood and Despised Icon. Canada continues to be a strong supporter in the global metal scene by offering such contributions as the Brave Words & Bloody Knuckles publication, filmmaker Sam Dunn’s series of Metal documentaries including the critically acclaimed Metal: A Headbanger’s Journey, and the Heavy MTL festival. In 2013, Canada’s own Crimson Shadows were crowned the Metal Battle international winner. A feat not easily achieved, and one of which we take much pride. It launched the band to an international level and earned them a record contract with Napalm Records. In 2015, Canada re-lived that success with Vesperia, once again taking the 1st place at Wacken. In 2016, Canada followed up with Profaner taking the 2nd place win. The year 2018 will be Canada’s 5th annual participation in the Wacken Metal Battle and will include 13 major cities in total: Toronto, Hamilton, London, Ottawa, Montreal, Quebec City, Winnipeg, Saskatoon, Calgary, Edmonton, Vancouver, Victoria and BC Interior. Only the strongest of contenders will be chosen to participate, to yield one true champion, and represent their nation with the highest honour, at the Wacken Open Air Festival.